1.9 How To Apply For JKSSB Para Medical Staff Recruitment 2019? 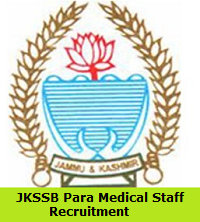 JKSSB Para Medical Staff Recruitment 2019: The Higher officials of Jammu & Kashmir Service Selection Board (JKSSB) had released the latest notification to fill 247 Para Medical Staff vacancies. Applicants who are interested to work in the medical field they can apply for these posts before 27th February 2019. We had provided complete information about JKSSB Para Medical Staff Recruitment 2019 Notification correctly and accurately. The Jammu & Kashmir Service Selection Board (JKSSB) had mentioned that the candidate who had completed their Bachelor’s Degree/Engineering/Equivalent from any recognized university can only apply for these vacancies. Through this article, aspirants can get more info of JKSSB Para Medical Staff Jobs 2019 for following these sections, such as educational details, age limit, selection process, important dates, salary details, registration fee, important links, others. All Interested candidates have to the complete information through educational qualifications for JKSSB Para Medical Staff Recruitment 2019 Notification in the below section. For all applied applicants have to see the official notification for the educational qualification is clearly mentioned in this notification. So please kindly check the notification for educational qualification. All candidates have to see the below section you know the post- wise vacancies for JKSSB Para Medical Staff Recruitment 2019. All applicants can get the selection process for JKSSB Para Medical Staff Recruitment 2019 for these posts can be mentioned in the below section. Application Fee for All candidates Rs. 350/-(Rupees Three hundred and Fifty Only)by Online payment gateway or Challan or CSC Connect. For all selected candidates can get the hand full pay scale for these posts for JKSSB Para Medical Staff Recruitment 2019. How To Apply For JKSSB Para Medical Staff Recruitment 2019? Initially, candidates have to see the official website of the Jammu & Kashmir Service Selection Board (JKSSB) that is www.jkssb.nic.in. In that you can see the many sections, then you can go to the recruitment calendar section. Then, go through that section you can search the JKSSB Para Medical Staff Recruitment 2019 notification link. Click on that link, then read the notification carefully. If you are eligible then fill the application form correctly. Take two or more copies of the JKSSB Para Medical Staff Recruitment 2019 application form for future reference. Our team Sarkari Recruitment had given complete and genuine information regarding the JKSSB Para Medical Staff Recruitment 2019. Candidates have any questions, they can leave us a comment in the below section. And you can also check all the information about Government Jobs, Admit Cards, Previous Papers, Results, Others. Thank You.